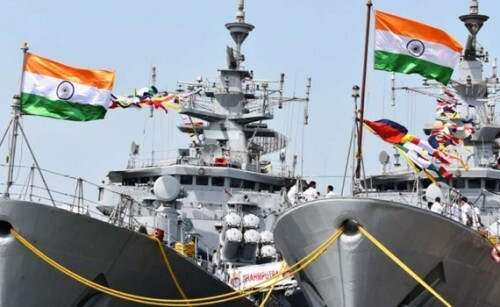 New Delhi, Oct 11 : The Indian Navy is going to host a day-long symposium on October 16 on the theme of 'building stronger maritime partnerships in IOR' that will see participation from navies of 16 Indian Ocean littoral countries. "With the Indian Ocean becoming the locus of the 21st century strategic landscape, the symposium will play a constructive role in bringing together stakeholders that have a role in evolving strategies, policies and implementation mechanisms in the maritime domain," the Navy said in a release on Thursday. The event, organised by Naval War College in Goa and to be inaugurated by Navy Chief Admiral Sunil Lanba, is a follow-up to the maiden Goa Maritime Conclave, 2017. It is likely to see participation from Indonesia, Malaysia, Singapore, Thailand, Bangladesh, Myanmar, Sri Lanka, Oman, and South Africa, Madagascar, Kenya, Tanzania and Mozambique from Africa, and island nations of Seychelles, Mauritius and Maldives. "The focus of the symposium is on capacity building among IOR navies to tackle emerging maritime threats, as well as discussing cooperative strategies for enhancing interoperability among partner maritime agencies," the release said. The symposium will facilitate interaction between senior representatives of navies and maritime agencies in the Indian Ocean Region (IOR) on common issues of maritime interest. It is aimed at establishing academic excellence and sharing of ideas amongst India's maritime neighbours, it said.